The check in clerk was very friendly and helpful. It was a convenient stay for us because it was close to the airport. Free breakfast was great. Our room was in a different building then lobby or office. The room smelled terrible. Not sure if it just stunk or was a mixture of stink & cleaner, the shower & toilet looked dirty & needed updated. My friend?s room did not smell & the hotel served its purpose. Convenient location to airport, breakfast. The small of our room. Great for the price and good overall experience. Didn't clean up after construction. The pet-friendly Baymont Inn And Suites Florida Mall comprises 162 rooms equally suited to the business traveler or families on vacation. Items included with the room rate at this two-story motel are an expanded continental breakfast, high-speed Internet access, local telephone calls and parking. There is one meeting room available for business or social functions that can accommodate 40 guests. 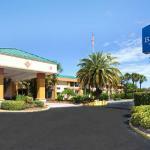 The property is three blocks from the Florida Mall and five miles from Orlandos International Airport. The major area attractions of Disney, Universal Studios and Seaworld are all less than 30 minutes away. The Florida Turnpike and the Beach Line are just seconds away from the hotel making it possible to be in Cape Canaveral and the Atlantic beaches in less than an hour. Rooms come with a choice of one king size bed, two double beds or two queen size beds. Amenities include high-speed Internet access, IDD telephone, 25-inch television with cable news and movie channels, refrigerator, microwave oven, coffee maker, iron and ironing board, coffeemaker and a hairdryer. Rollaways beds are available for a fee. This inn has an outdoor swimming pool, a childrens pool and a fitness center. The complimentary breakfast is the only meal served here. Restaurants nearby include a Carrabbas Italian Grill, a Red Lobster, TGI Fridays, Olive Garden and a Ruby Tuesdays. The 24-hour front desk has safe deposit boxes and information on the area attractions and events. Other amenities include a guest laundry, valet dry-cleaning, business center and ice and vending machines. This hotel was formerly a Holiday Inn Express. It got good reviews then and it continues to get them under its new branding. The location is good near a massive shopping mall, the rooms are well equipped and the rates competitive with neighboring properties. This may not be the best place to stay in you are in town to see Mickey and his friends but it is great if you want a shopping spree. Many clients said the employees here were friendly and efficient and the free breakfast made a great start to the day.